Now that I’ve gone back to a day job (bye bye breakie! 😥 ), my yarn-time has reduced drastically. So much that I’ve started setting targets — like knitting at least an inch of material every day. And then I fall short of that target most days, either because I’m too tired (or sleepy) or because I have other things to do. Since the lacy hearts cardigan is crawling along at snail’s pace, I’m showcasing a past project of mine — a multi-directional diagonal scarf. Anyway, back to the scarf. Who knew the simple garter stitch, when coupled with short rows, would turn into such a beautiful-looking scarf! Look how lovely the texture is! 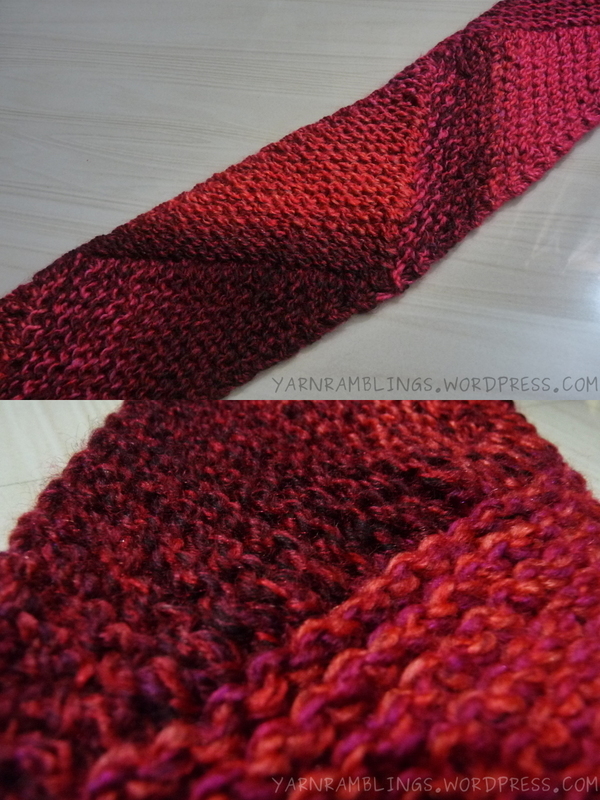 I liked it so much that I made another scarf using the same pattern and a different stitch. The result delighted me. I’ll leave it, along with the discoveries I made then, for another post. 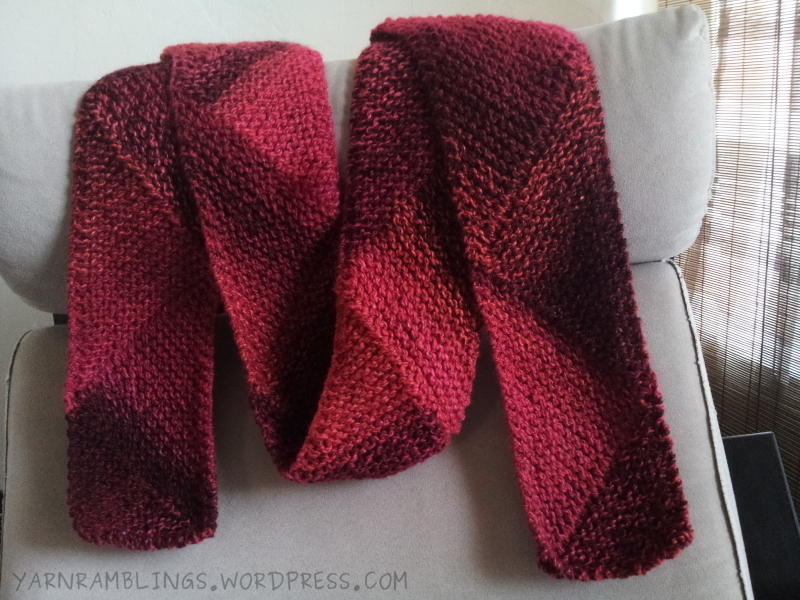 I haven’t made much progress this week on my ongoing cardigan project, so I thought I’ll write about this reversible-patterned scarf that I made quite a while ago. 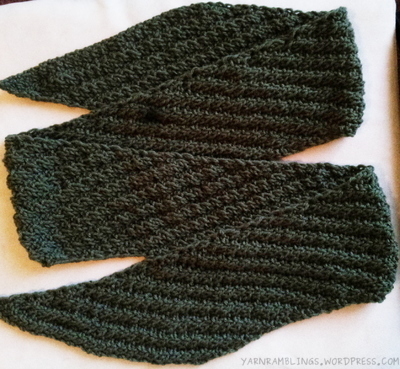 I started out wanting to use the mistake rib pattern in a scarf with tapered ends. For the tapering, I decided to make increases every other row. But then, I was distracted while knitting, and I ended up moving the mistake rib pattern one stitch left (or right, depending on what you consider the right side) with every increase. But as luck would have it, since the mistake pattern is reversible, this ended up becoming an oblique mistake rib! It looked so good that I didn’t bother correcting it. Instead, I continued moving the pattern by one stitch even after I stopped increasing the end. And for tapering at the other end, I made my decreases along the edge of a single oblique strip in the pattern.